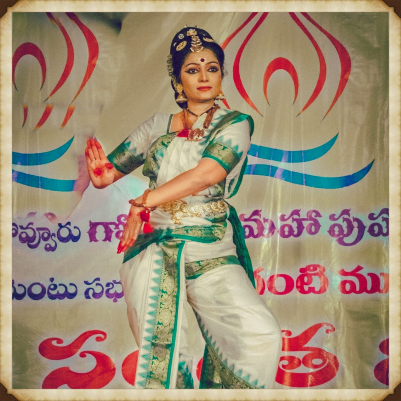 Madhurima is a gifted, seasoned dancer of unprecedented and graceful intensity, of the Kuchupudi School of Classical Indian dance with a high passion and dedication to the art, from her childhood. Madhurima started her Kuchupudi learnings from legendary Padmabhushan Dr. Vempati Chinna Sathyam at the age of 12. She continued her learning under the able guidance of Guru Smt.Sathya Priya, the Founder – Director of "Narthana Saala" and a senior student of Padmabhushan Dr.Vempati Chinna Sathyam, for more than a decade. She continues her learning under guidance of guru Sri Ravi Vempati. Madhurima conceptualized, choreographed and performed the opening event "Swagata Geetam" for 2nd International Kuchipudi Dance Convention at HICC, Hyderabad on 24th December, 2010. This ballet "Kuchipudi Vaibhavam" is written by Sri Jonnavithula Ramalingeswara Sastry and music is composed by Ramachari. ​"She reminded the audience of GODDESS GANGA through her dance, personality and the very appearance on the stage in the most convincing Kuchipudi Dance ballet, " Gangaavatharanam", was the version of the entire media at the premier of the above cited Kuchipudi Dance ballet, a master piece choreography and a creation by Guru Smt.Sathya Priya, which speaks volumes about the most sacred mythological character, GANGA, in the Indian ExpressChennai. Madhurima's recital was filled with beautiful abinaya combined with creative imagination. It was a visual delight to watch this comely dancer negotiating the curves peculiar to Kuchupudi. She has established her identity in the dance form with an involved perfection in laya, and tala. She is an accomplished artist in the field of kuchipudi dance, who won many accolades from all over. She actively participated in several performances, workshops and lecture demonstrations. She performed in all the well known Sabhas and dance festivals. she is a stunning exponent of Kuchipudi described as an artist with a Gazel like grace, immaculate footwork & revelling abinaya. A versatile artist, who has established her identity in the dance form with involvement and dedication. She has enthralled audiences with her scintilating style. Madhurima specialised in this art form through her vigorous practice and dedication over the years. Genuine effort, hard work and artistic skill are in perfect blend in her dance. She demonstrates power and energy in her nritha with brilliant footwork.